Top is the first one I made. I abandoned the more aesthetically pleasing strap around the short side for the more secure strap around the vulnerable side, as you can see. Some have pockets in the flaps, some don’t, but in the end what you could store in them was so limited I stopped making it a def. feature. Some have fabric straps with Velcro closures, some have elastic and are attached. I really like the completed one made from old blue jeans although that one is a COVER only with no integrated stand. I like the pocket a lot. DHs version has slightly looser elastic holders at the corners so he can insert the iPad while it is IN the “official Apple iPad cover” for that added security. I also made him a strap that can be added for carrying, but that is the potential fail – without using it we don’t know how secure it is, and by using it, if it isn’t, we don’t know if her is putting his pad at risk! You can see how the integrated stand works in the middle picture there.The angle is somewhat adjustable. Now that is out of the way I can maybe ge back to some stamping and scrapping and crafting! 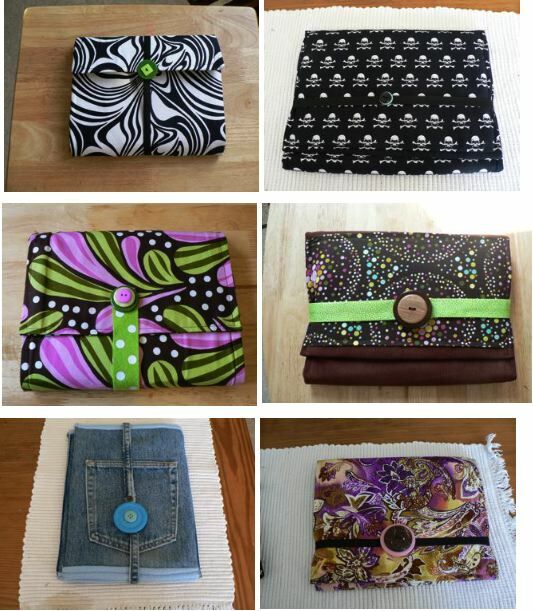 Categories: Mac specific | Tags: iPad cases, Mac specific, sewing | Permalink.